We encourage you to explore the Commission's website. Our goal is to provide information about the many ways in which we can all work together to study, protect, and enjoy New London's exceptional natural resources. The Conservation Commission's overall objective is to develop and lead programs and activities to reasonably protect and expand the significant and diverse natural resources in the Town of New London in order to maximize the enjoyment of these resources by all current and future residents and visitors. Detail concerning the defined mission, major activities, and membership of the Commission can be found in the About section. The Hospital Community Trail is currently closed due to construction work. We hope to have the trail reopened in the future. Forestry Harvest and Wildlife Habitat Improvement. NLCC worked with Leo Maslin, licensed professional forester, to complete a harvest at two conservation properties in town. Leo has worked with the NLCC on other successful forestry harvests for New London. These properties, off of Mountain Road, needed attention and the tree harvesting proved benefitial to the health of the forest and to the wildlife habitat. The project was also cash positive, as the harvest paid for itself and gave funds to the town. With the completion of this project, the NLCC will be looking at other conservation properties that are in need of work. The New London Conservation Commission is happy to announce the availability of our newly updated "Footpaths in New London and Vicinity" trail maps. These maps give a brief description of each trail, their location, trail distances, and other related information. We thank Mark Vernon for all his hard work getting the map information updated. Dogs are welcome on many of the trails but dog owners need to be responsible and clean up after their dogs. DOGS ARE NOT ALLOWED at the Philbrick-Cricenti Bog trail or at the Knights Hill Nature Park trails. Also note that leaving dog waste on the trail is discourteous to others and a health risk to children! Bags are available at many of the trail heads for your convenience. PLEASE COOPERATE. News - The Conservation Commission is always working to improve and expand conservation land and trails around town. Please click on the link above to get full details on the latest projects. 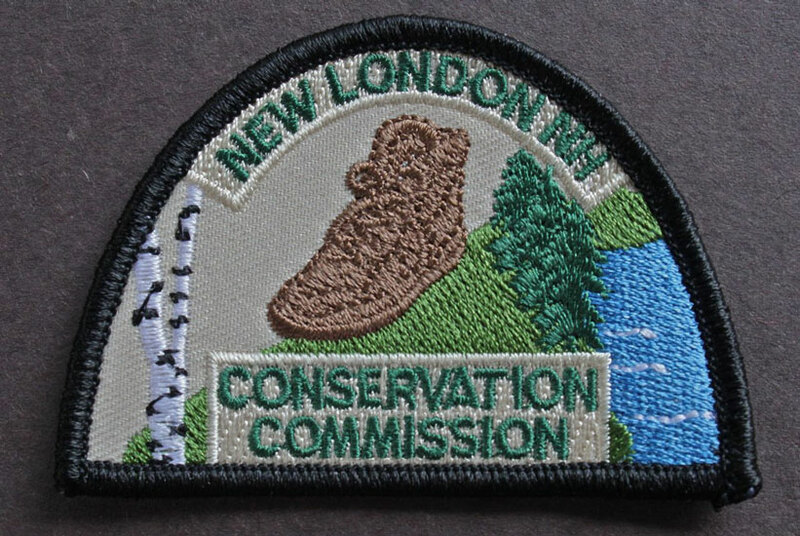 Trail Patch Program - The Commission recently developed a program whereby hikers can earn a patch to recognize the completion of all trails maintained by the commission. A description of the program and guidelines are available in the trails section. Invasives - The Commission has developed a Homeowner's Guide to Control of Japanese Knotweed, a particularly troublesome invasive established in the region. The Education section provides a link to this guide as well as additional links concerning invasives. Meeting Minutes - Minutes from prior Commission meetings are available via this link at the Town of New London website. Recent Projects - Explore materials regarding current Commission projects. New London's Natural Resources include many high quality lakes, streams, forested acres and open vistas that are the focus of the New London Conservation Commission's activities. 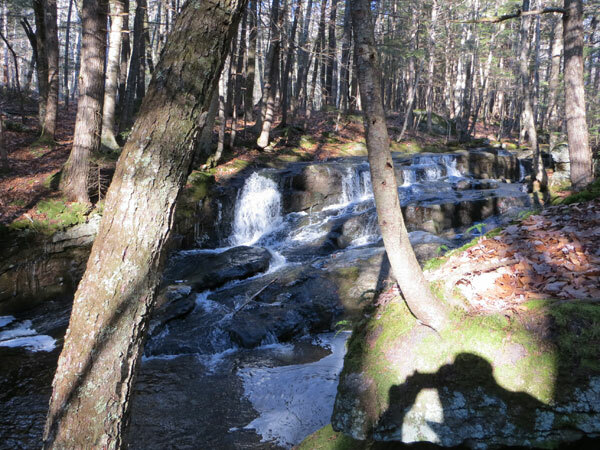 Above is a view of the Lower Cascade as seen from the Great Brook Trail. This trail one of several trails maintained by the Commission with the assistance of many trail adopters and trail maintenance volunteers. The trail system in New London is exceptional and consists of over 26 miles of trails of varied length and difficulty. Visit the Trails section to view a description and map of each trail. Avid hikers are rewarded with the patch below. Click here for details.